The valuable information in your Planned Maintenance schedules and PM work orders can be accessed in various reports in both Planned Maintenance and Work Order. Below are a few recommended reports from both products that show the success of your planned maintenance program. What it does - Generates a "corrective maintenance" vs. "planned maintenance" comparison of labor hours, labor and material costs, and total costs associated to equipment tracked in Work Order and Planned Maintenance. *Note: Equipment has to be tied to PM Schedules and transactions have to be associated to work orders in order to create this report. Why it's great - This is an excellent report to run to help compare and analyze the amount of time and money invested in each piece of equipment for corrective maintenance vs. planned maintenance. This report can be used to help determine when it might be more cost effective to replace a unit versus continuing to invest resources into repairs. In Work Order, click on Report in the Actions menu, and then click on Equipment. Enter the criteria for your report, making sure to select Summary Report - Maintenance Costs versus Preventive Maintenance Costs in Step 16. What it does - Allows you to view and print a PDF snapshot of upcoming PM schedules. The calendar can be filtered by the month and year as well as the Location, Classification, Type, Craft, and Assigned To fields. Why it's great - The PM Calendar is a great way to quickly and easily view upcoming PMs scheduled for your organization. This could be very helpful when planning your resources. Click on the Calendar tab in Planned Maintenance and select the criteria from the filters (location, classification, type, etc.). To load the report, click Print This! What it does - This report contains all of the information provided on a work order including codes, journal notes, and even automatic emails. Why it's great - The Work Order Detail is an excellent report to open in Excel. 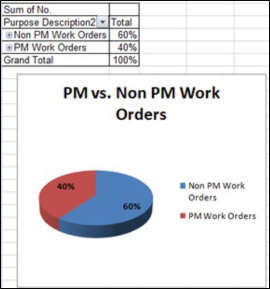 The report results include every field on the work order allowing you to create a Pivot Chart/Table to compare your organization's PM work orders vs. Non PM work orders. In Work Order, click on Report in the Actions menu, and then click on Work Order. Enter the criteria for your report, making sure to select Detail Report in Step 21.